In August 2013 the Sport Authority of Thailand travelled to England for a WAoS hosted Study Tour, providing them with a valuable learning environment to discuss world leading thoughts on event strategy and sport management. 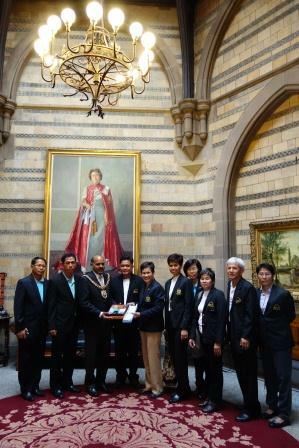 13 delegates from the Sport Authority of Thailand travelled to England for a Study Tour of London and Manchester. The key outcomes for the tour focused on participants gaining a better understanding of event legacy and sport pathways for athletes, from grass roots through to high performance programmes. The tour visited a large number of destinations with the purpose of aiding attendees in achieving their goals. Visits included tours of the London 2012 Olympic Park, Manchester Sports City, the British Olympic Association and the English Institute of Sport where presentations were also made by senior management of each respective organisation. There were also visits to three of the country’s most prolific football clubs; Chelsea FC’s Stamford Bridge, Manchester City’s Etihad Campus and Manchester United’s world famous Theatre of Dreams. Some of the topics on the agenda comprised of principles and processes involved in preparing athletes for major events in order to maximise performance and how major events hosted locally aid the regeneration and development of cities. Speaking on her return to Thailand, Orasee Jayapoom, the Chief of Sports Personnel Development at International Level Section, reflected on the productivity of the tour. “I'm so appreciative for the effort, the hospitality everybody has given us. We will now report the productive results to the Governor and Deputy Governor [of the Sport Authority of Thailand] and hope that the project may be continued for many years to come” she stated. Michael Cary, Director of Brand and IF Relations at WAoS, lead the tour and commented “we have worked with SAT for the past seven years and had close to 200 graduates from within the sport system there. It is a pleasure to now host them in the UK and bring to life many of the strategies and concepts we discuss throughout the programmes in Thailand. It has established specific education partner academies with International Sport Federations representing over 800 national federations, providing tailored education for their members. The Sport Authority of Thailand is a main principal office to develop the excellency and professional athletes to be the best be Asia. Their main aims include the nationwide promotion of sport, to provide support, help and advice in organizing and operating amateur athletics and to explore, build and restore amateur athletics in the country.